Something new to do in War Ender. Happy fall! I, for one, am glad to be out of the hot weather. I’ve always preferred the cold, not to mention certain earthly creatures go away and I’m not sneezing every ten seconds. But enough about me! Let’s go over some changes implemented in War Ender during the month of September. …oh, is that it? Well, not quite. My list of things to patch has been awfully small, something I’m thankful for. So instead I’ve put most of my efforts into creating new levels for War Ender. I said in the last dev blog that new levels would be released to everyone, and I intend to make good on that promise. I went through and picked two levels that were ultimately scrapped from the final game, and will be releasing them to the public. In addition, there’s another level that I somewhat forgot about. Today, I’ll show off two of the scrapped bonus levels and explain the original idea behind them. I won’t show off the third extra level but I will certainly give a little background on the level. So with that, let’s start by taking a look at Extra Level 1! Originally, Extra Level 1 was to be the first bonus level you would unlock. If you somehow happen to have an old version of the War Ender demo on your hard drive, you could even play this level, though it’s been given quite a few new things since then. For instance, you’ll notice in the gif above that Obsessors and Pyro enemies are present, which is not something the original version had. And of course, things like the building background art is here too. As the extra levels go, this one is pretty straightforward. It’s basically another War Ender level, which was exactly why it got omitted from the original game. The bonus levels needed something much more interesting to make them, well, bonuses. This wasn’t going to cut it, so I cut the level from the game. However, now that Extra Levels are now in the works, it seemed appropriate to bring this level back, give it some new stuff, and give it to you as the first extra level. Extra Level 2 is a scrapped level from Chapter 3. Those who played through War Ender knows that Chapter 3 is split into four levels, just like the other chapters. However,I believe this chapter has a slightly different structure than the others. Most chapters have a sort of theme to them. For instance, Chapter 2 largely takes place underground. In Chapter 3, you’re first outside on top of buildings, followed by being attacked by The Detractors of War and taken to their base. You fight through the initial forces to then go through a level where you must escape, and then you fight a boss. 3-3 was not originally going to be a scrolling level. It was originally planned to be a level with an emphasis on platforming. But then I liked the idea of an escape level more, so I thought I could make this into a bonus level. Then the bonus level revamp happened, and so the game had no place for this level…until now! There won’t be much fighting in this level, as the Detractors forces are spread rather thin. But rest assured that a challenge does await you in this extra level. There is a third extra level, but it’s still going through a lot of work and is not in a presentable state at this time. You’ll have to wait until the levels are released to see what this third level is about. I will say this…originally this level was not an actual level in War Ender. Not a regular level, bonus level…no, instead it was what I will call a “pitch level.” It dates back to when the game was called Action Square. I would use this level to demonstrate the basic mechanics, enemies, and structure of the level. Of course, the game has evolved since then. For starters the name of the game isn’t even the same. While I will take a few liberties with what enemies are present and where they will be placed, I’ve left the geometry of the level intact. No added mechanics are present in the level structure. The only changes are the main character and the enemies. Everything else is as it was when the game was just a side project called Action Sqaure. There aren’t even any jumppads! It’s been nice sharing what’s in store for War Ender. There’s some other works going on as we speak, something I talked about in the last dev blog. In particular, my next major project has gone through some leaps and bounds in development, while my smaller, more narrative focused project has been chugging along. I’ve almost got the game’s gameplay 25% completed. It’s been an exciting month and a lot of progress has been made in a variety of ways. And this is even when you factor me being gone for a week on vacation! So imagine how October will be in terms of development progress? And maybe, just maybe…the extra levels will be released before the next dev blog goes live! August has come and gone. Removed a rocket turret from level 1-2. Fixed a bug where the player could hide behind the laser wall in Wall of Lasers. Fixed a bug where the "fade sprites" could appear after death. Fixed camera bugs involving RAWM. Took care of some game breaking bugs that would appear in RAWM level. Found and fixed a save game issue that was present in chapter 2. Fixed tiling issues seen in all levels that took place in Cycorp. Adjusted a moving platform in 3-1. Adjusted position of first checkpoint in 3-1. Fixed bug where dodging could still get you hurt. Repositioned some enemies in 3-2. Fixed bug where player would not die after camera moves past them in 3-3. Made some edits to third part of 3-3. Fixed a bug with Cyborg Soldier and his laser attack. On top of that, the following has been added to War Ender as well as on the Steam version of the game. Wall of Lasers now makes it more obvious that the laser cores are to be shot. Game demo is now available for download on Steam. Never tell me I don't keep busy. And there's still more to come! Now we come to the part where I talk about War Ender's future. Now you may be wondering "hey, this is a simple indie platformer. What more could you do with it?" Oh, let me tell you! I'm looking to add new levels and modes to War Ender post-release. How many of each is something I've not settled on yet, but there are plans. Right now, it's almost certain that you'll get a few more additional levels for War Ender. You see, I have a decent number of levels that were scrapped at the end. Some of them were bonus levels before the revamp I gave those, others were something else entirely. I also mentioned new modes. There's a few ideas I have in mind, but for right now I'm looking into implementing a "single life challenge" into War Ender. Basically, you'll play through the whole game with only a single life to get through it all. This is not including the bonus levels or any extra levels the game will receive. Sounds incredibly tough but I promise it's doable. It's not much, but I believe it will give diehard fans a reason to continue playing and mastering the game. And of course if you don't want to bother with it, that's totally okay too. It can exist as an option for players. A release date for such a game mode is even more unpredictable than the extra levels. It could take some time. So I won't give any estimates for it for the time being. But it's something to look forward to in the meantime. As mentioned before, there are other game mode ideas too but I'll talk about those if I do decide to create them. There's quite a bit of potential that exists for War Ender in the future, and I look forward to showing off more as that future unfolds. Beyond War Ender, I'm currently working on two new games. Well, sort of. Only one of them has entered active development. Hopefully I can start teasing it more later this month. The other project is still in its research phase. I'm currently going over a lot of material to learn the ins and outs of the games I'm drawing inspiration from with this next major project. And even after I start working on it more, it could be a while before I begin to show anything off. Hopefully by the next dev blog I'll be able to show off more of my smaller project currently in the works. Right now, most of the mechanics are in. I'm primarily working on creating the branching storylines. Oh yes, this game will have dialogue options and multiple endings and that sort of thing. It's one of the more story driven games I've ever made, which is unusual for me. Usually my games are more mechanically focused. But you know what they say...there's a first time for everything. So with all that said, I hope you continue to enjoy War Ender! See you in October! The game is out. So what have I been up to? I've found myself in an odd position after War Ender was released. I sort of knew that it would happen, but it still feels odd all the same. Working on a project for a year and a half and releasing it to the world does this to you. What am I talking about? Well, I'm in a state of mind where I want to start other projects and don't really know how to begin. This isn't unusual, and as I said I expected. I haven't done much with development of any kind since the game's release because I've been trying to play catch-up with some other things going on in the background. All that said, I'm still tossing around some game ideas in the back of my mind and am looking forward to translating that onto paper and eventually code. As a result of all this, this will be a shorter dev blog, but I think it's a good place to share a couple announcements. Since we're on the topic of getting War Ender out and about, I think it would be nice to continue to demo the game IF it's possible. Of course I'll keep you updated on those things, but I believe it would be nice to continue demoing the game where possible to help the word get out more and to continue building my own audience. And speaking of building audiences, that's partly what these dev blogs are for. I should probably talk about a change coming to them. After this dev blog that you're currently reading goes live, dev blogs will now be arriving on a monthly basis instead of bi-weekly. Why? Well, as War Ender is now done there really isn't much to talk about. And I don't know how soon I'll be able to start showing off new projects, so for my sake and yours the dev blogs will start being created monthly. It helps you because I don't want to waste time on dev blogs that don't actually tell you anything, and it helps me as I don't have to struggle to come up with things to write about. I wish I had more to share with you right now, but as I'm catching up with some life stuff I haven't given myself much time to do anything development related. But by September, when the next dev blog goes live, I may start to have a little more to share about what I'm working on, specifically with the smaller project that I teased in the last dev blog. I do hope you drop by and check it out when it arrives. But until then, I hope you continue to enjoy War Ender. And tell your friends about it. All of them. War Ender is Available Now! How exciting! A game I had been working on for over a year can finally be in player's hands. To celebrate the game's release, I thought I'd take a little time to recount the journey as well as give some shout outs to some people that helped out. Finally, we'll round this off with that I'm looking to do in the future. So without further delay, let's start with the story of War Ender's development. Once upon a time, in late 2016, something needed to change. I had just gotten out of a rough development cycle, and was frankly feeling a little down. The game I had been working on was canned, which is always an unfortunate end to a project. It was a shame too, because I felt it was a really neat project with some cool ideas in it. But after all that, I began to question my game development career up to that point. With every new project, I'd always try to outdo myself in terms of complexity of the project. But after this last game, I felt that maybe it was time to take a step back (or two) and do something simpler. Thus, I started making a platformer. At one time, this was literally the planned game. I wasn't content with just making another platformer though, so I decided to add some shooting elements to the game. Next thing you know, I have a basic game starring a red square that can jump and shoot. So naturally, I started making a few basic enemies. One enemy that could shoot, and another that would just walk around. 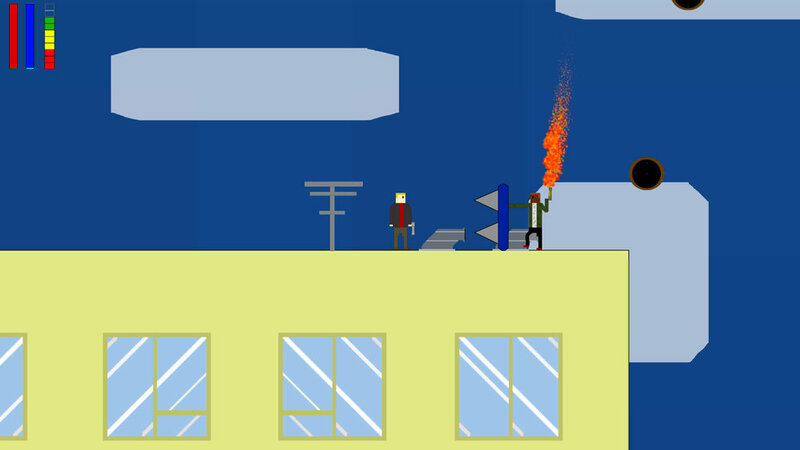 After that, I started thinking about how to make this game with platforming mechanics have, well, platforming elements. I wanted to try and do something different...but what? "Hm" I said. "How about he floats in the air by firing down?" It was a dumb sounding idea, but at the same time I wasn't making this game with the intent to be smart. At this time, it was still just a small side project that I'd probably put out for free or something. I didn't actually expect to make characters, worlds, and an entire story. But reality had different plans for me. One day, I hear about an upcoming convention happening near me. I decided to take a stab at it and submit what was currently called Action Square to the convention people. So I made some more enemies, a few more levels, and sent my little game to the curators. The rocket turrets kept their original design. Though it would be heavily improved, this was an early version of Level 1-2. Unsurprisingly, it didn't make the cut. It was pointed out to me that it's hard to get interested in a game with a square as the main character. Only Thomas was Alone can do that. So, that's when the idea came to make Red an actual human and not a literal square. So, I gave him along with the other enemies a bit of a redesign. Suddenly, there were humans populating this world I inhabited. And the moment that happened was when I thought "you know...maybe I should see this project more realized." That was about the moment when Action Square would be moved from a small side project I did for the heck of it to a full commercial release. The first one I had ever done, in fact. Oh, and obviously it was no longer called Action Square. It was renamed to War Ender. And so began the full development of War Ender. It's honestly hard for me to recount what happened and when up until a certain point...the website's launch. You see, I knew I had to get a website together for a game that I was going to sell. But that wasn't the only reason that I was putting together a website. I was going to off to a convention soon. This would be the first time that I had ever put together a booth (I bet it showed). So next thing you know I'm making business cards, a website, and working hard to get the game to a presentable state. Notice there's only two UI elements? The dodge mechanic had not yet been implemented. The convention went well and the website started seeing more traffic. Now it was time to start working on the game's story and make the remaining levels. Life carried on this way, with the occasional trip to the St. Louis Science Center to help to promote the game. Now and then I'd add a new element to the game, whether it be a brand new enemy type or an entire mechanic. It was during this time that the idea to allow the player to do a dodge was implemented, adding to the complexity of the game. Truth is, there's not a whole lot of major moments in the game's development beyond that, at least until the beta. Bonus levels did get a major overhaul, the soundtrack would see its completion, and much more. When War Ender began its beta phase, that's when things went from interesting to borderline insane. And I mean that in a good way. The game is very different from how it looked just a few months ago, right down to the art. Level 1-2, showing off talking characters. The level itself would still go through many changes before becoming what it is in the game. I didn't get many beta testers, but the ones I did get were all amazing and brought something very important to the table. I'll be dedicating a section of this blog to them, so let's wrap up the development story and get to their shout outs. It was thanks to the beta testers that War Ender got drastically improved and, if you can believe, easier to maintain. Next thing you know, the story was being delivered differently, controls were being reworked, and the dodge mechanic would get an upgrade. It's thanks to the beta testers that all my favorite parts of the game are presented the way they are. Finally, I got an artist to join on board. It just so happened to be my brother-in-law. I had no idea he did pixel art, so when he came to me and asked if I was interested in having him on board, I thought "yes, absolutely." Next thing you know I'm getting images showing me the improvements to the visuals that were coming. I'd pass this along to one of the beta testers (who happened to be an artist herself) and she'd give advice on how else to approach the game's look. The original plan was to completely overhaul the game's visuals, but due to some real world things happening in the background, it didn't quite happen as planned. But hey, we got what we could and the game looks a lot better for it. The final moments of development happened really fast, but thankfully with no major hiccups. There were certainly some...interesting bugs (fire for some reason stopped working the way it normally would), but nothing completely game breaking happened. Finally, on July the 26th, 2018...I woke up. I headed over to the computer and opened up all the different store pages. My wife, Katy, came along to join in on the launching fun. And then...the game was out. Another shoutout goes to Wesley, the man behind the game's improved visuals. He came in very last minute, and I both thank him for his courage and of course his lovely work. Next up are the beta testers, who each contributed something to the game. I already mentioned Katy, so now we move on to my good friend Harsh Gupta, responsible for helping me get War Ender's story together (it was a bit messy for a while...). Harsh can be found here. A thank you to Jenny Gibbons, who helped give art input when the artist initially came on board as well as feedback on control layouts. Having good control layouts is pretty important for a game like this, so her feedback was extremely helpful. She actually just put out a game herself, which I will link right here. Go give it a look. Then there's Matt Schelsky, the man responsible for the input that would improve the game's dodge mechanic. I met him along with the rest of the Daemon Club crew at the Gamer Grace Convention in Illinois. You can find him here. And of course, though I may not know their names, I must give a shoutout to everyone who played an early build of the game and gave input, whether it was at a convention or through e-mail. So here we are...game is out, it's done...where do we go from here? Well, let's start with War Ender itself. If Wesley chooses to, we can still work on the game's art and get it to look even more beautiful. Aside from that, I don't know how much updating War Ender will get beyond bug fixes and the like. It might be dependent on a few different things. I haven't quite decided yet, but I'm sure you'll learn one way or another. As for this website and dev blog? Though the website itself may not get much in the way of updates, I intend to maintain this dev blog for a little while longer. I have no clue what I'll write about, but it could become a space to share what's coming up in the future. But what about beyond War Ender? Well, I have a few ideas. I've been inspired by none other than Mike Bithell himself lately with how he's handled his last couple of games. Make some small titles and release them has been the general gist of what he's been doing lately. I've taken a fondness to that idea, so I may try something similar. Obviously, he has a much larger following and can do stuff like that more easily. Of course I'd try to get the new games I make in front of people when ready. This isn't to say I'm done with large projects. Far from it. I just think it would be good for me to work on smaller games that take a short amount of time to make. In between those I intend to work on a larger project that I suspect will outdo War Ender in a number of ways. The ambition is much higher this time, but I think I can pull it off. I won't say much about any of the projects for a while, but I will go ahead and say this. The big project is intended to be an FPS, and the first small project will be about aliens. I won't say anymore about them until they begin to be presentable. With these new games, a new website will more than likely be made. I intend to have a central hub for all my works. When I will put this site together remains a mystery. And with that, I think that about wraps everything up. I did say in my last dev blog that this would be a bonus and you'd still get another dev blog next week. I still have no clue what I'll write about, but I'll come up with something. I may have to adjust how frequently I post here after that, but we'll cross that bridge when it comes. Until then, don't forget to check out War Ender at the links above, and do tell your friends and frenemies about the game. I'd really appreciate it! I'm already feeling all sappy, how will I feel on release day? It has certainly been a journey for myself and War Ender. As I write this, we are only one week away from War Ender being released to the world. To say that I am excited would be the biggest understatement ever uttered by a human being. I am hyped. Incredibly nervous as well, but hyped nonetheless. I think it's safe to say that this game's release will be a defining moment in not just my career, but in my entire life. Of course, "defining moment" could mean a few different things. For starters, War Ender could totally flop. I acknowledge that in this current gaming climate, with Steam getting hundreds of games in a given month and it being incredibly difficult to get noticed, that the act of flopping could be a reality. But then there's the other side of the coin, where the game does well and everything is great! Maybe there's a third side (somehow), where the game exceeds expectations? Perhaps so. But I know I should keep my expectations reasonable. Speaking of reasonable expectations, looking at how things are going right now I feel confident saying that War Ender is going to be alright. Since launching the game's Steam page the website has been doing well. The Steam page in question, according to the info I have, has gotten a pretty decent amount of attention. In fact, I was a little surprised by how much it had gotten in just the first day alone. With so many games coming out on Steam, I thought it was incredible that the game was being seen as much as it was! But I can hear the realist in me. "That doesn't mean that many people will buy it, or even think it looks cool." You're right, realistic side of me. But I'm willing to bet many people saw the game and thought it looked great. And I feel this way because the game has already been wishlisted by people, and I've even had a handful of people on Twitter tell me, publicly and privately, that they're looking forward to the release. I know I should keep expectations in check but I really feel good about all this right now. I think it helps that the game has undergone a vast number of improvements in a short amount of time. Since announcing the release date some new particle effects have been added to the game to give more feedback to the player. In addition, I've added an effect where the edges of the screen will darken as the player gets low on health, and other little things. For instance, the VS text that shows before bosses has gotten flashier. It could just be me but I feel like screenshots are now more interesting thanks to the additional effects that have been added to the game. Robots being shattered and electrical sparks flying everywhere makes for a more exciting image. And of course, I also have some new art in place, improving the game's visuals even further, thanks to the artist who came on board. I suppose I should take a moment to address said art, as for a while I made it sound like there was going to be a visual overhaul. This was the plan, but some things happened in the background that has prevented a complete overhaul as expected. However, we've done what we can to improve the look of the game for the time being. A lovely looking sky complete with a background accompanies city levels. Factory levels have been given more atmosphere thanks to some lighting and new objects, among other things. As of right now there are still plans to get everything else upgraded, but I'll address this further in a later dev blog. Looking back, I think this became a dev blog talking almost endlessly about how great this game is going to be rather than talking what's new. But simultaneously, considering that the game is just a few short days away from being released, I feel a blog like this was needed. And in my humble opinion, perhaps even earned. I'm very proud of what this project has become. What started off as a small, non-important side project has turned into the most important, and indeed most fun, game I've ever made. Before I sign off, I feel I should once again mention War Ender on Steam, which you can view here. I highly encourage you to wishlist the game. Doing so will let you know the moment the game is released and available for purchase. In addition, I recently overhauled the media page for this here website and would encourage you to give it a look. There's lots of updated screenshots and a new trailer to view. Finally, on July 27th, the day after War Ender is released, I'll be doing an bonus dev blog celebrating War Ender's release. During this dev blog I'll be taking a moment to personally give shout outs to people who contributed to the project, whether in the form of feedback or in actual assets. I'll also be taking a look back at the overall journey of War Ender, and maybe even give you a sneak peek at what's coming beyond War Ender's release day.